Diana Ptaszynski of Suburban Girl Studio makes some really fun beads - I have some of her scarabs and trilobites (two of my favorite geeky subjects) as well as some seashells. 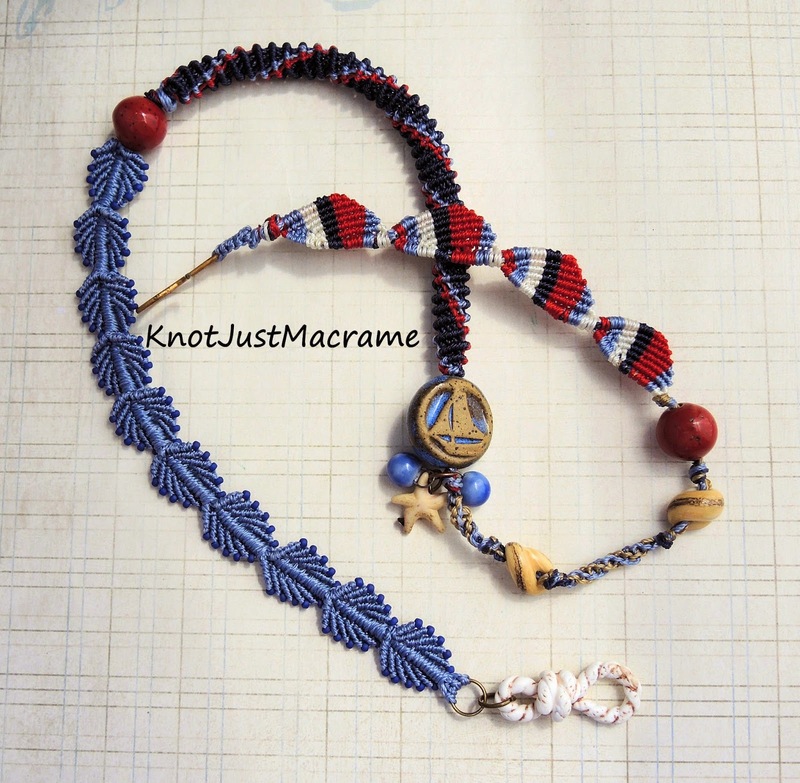 Recently I purchased a set with a sailboat bead and some coordinating rounds and I wanted to run with the nautical theme. I started out with a variation of the leafy micro macrame pattern I've been working with quite a lot lately and added some tiny seed beads at the ends of the rows. I kind of like the way the beads outline the shapes. After putting in a large red bead (also from Diana), I added a section of spiral knotting with some deep navy blue and red along with the medium blue I used in the first part. Next came Diana's sailboat bead. Two more of her beads and a little starfish dangle below the bead add a little movement to the piece. in the shape of shells. They are so pretty and different than any of the glass work shell beads I've ever seen. The red round bead is a match for the one I used earlier. I'm rather proud of the last bit of knotting on this bracelet. I wanted something in keeping with the nautical theme and for some reason the little pennants came to mind. The little triangle shapes I ended up with seem to mimic that fairly well! Did you notice the knotted rope clasp? My friend Cory Tompkins made that for me just specifically for this piece! The rest of it is just too special to end it with a boring clasp and when I asked her to come up with something, she made this! I love it and I paired it with a simple brass hook to secure the bracelet. After all that, you know what the best part is? Not only is this an awesome wrap bracelet, but it makes a pretty legit necklace, too! What a fun piece of jewelry with so many options. Awesome! This was a great tour around the nautical bracelet/necklace. I really really like it. Sherri this is awesome. I love each piece of this and the fact that it can be worn as a necklace or bracelet is a bonus. That rope clasp is super duper as well!!! Is is ceramic, fiber? Love is all.